AYD - March 8, 2013 - Do you see what I see? 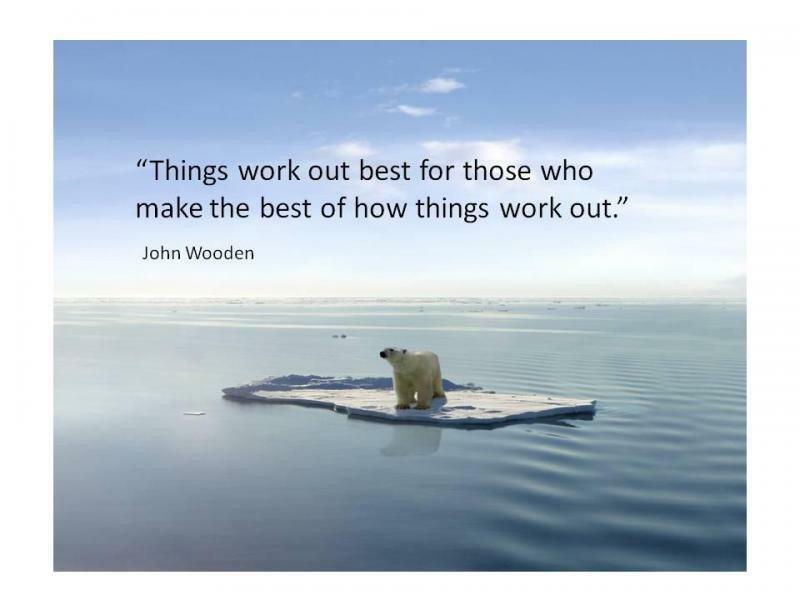 Have you ever heard, "It's not what happens to you; it is how you respond to what happens." ? Maybe in some variation you have. I know I have heard that comment in the last few years more and more as I travel my journey of Self Leadership and Self Awareness. Sh*t happens. Heard that one? Is what it is. This one? When it all comes down to it, it took me some life experience, some self pity, some whining, then some soul searching and I dare say some repetition of all of the above, before I started to see what I see. I could trade a moment today, to dwell on a moment from yesterday that cannot be changed. I could use the moment from yesterday, accept the shape of it for what it was, and set my marker of action from right now instead of the imaginary "What should have been". I, and we, have options to see things in a better way. There are things that happen, and once they are done, we may just have to alter the course of our plan to realign our navigation. Did you have a tough week? Okay. You did. You know it. Now, where do we go from here. Identify the issues, gather our thoughts, review that To Do list, set a new schedule, breathe, think calm and don't stare at your feet because to see where you need to be, you must look up and keep it in your sights. Keep your eye, on the ball - not your chin on your chest and your shoulders sagging. Back in school - when we got in trouble...we would have to write lines. I did not care then. But, Now I see what I see. So....start your day, with 10 deep, fully enriched breaths. Deep in, full out. And with each one, repeat after me... 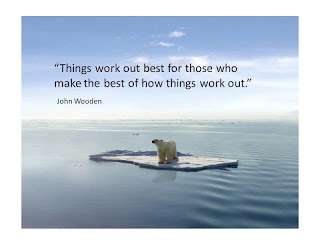 Things work out best for those who make the best of how things work out. Challenge your day to be an exciting one. Stay in the moment, and visualize how you will command any event. You may just preserve a moment and keep things on track to work out the way they were planned. Great morning, great day. Great you, good day for others. Husband, Daddy, Author.....and Blessed for how things have worked out. "When it's after 2am, just go to sleep. Because the decisions you make after 2am ... are the wrong decisions." Obviously this little comment could be referring to many things we encounter after 2am. Just think of a nite out when you were younger and more carefree, add a bar, some spirits and any number of life decisions present themselves. And we were most likely not in the best decision making state. Point - pick your battles, and more importantly pick the right time to state your case. Take the time to make sure you have your thoughts collected, and you do not speak from a more irrational and emotional reaction state versus a more level headed one. Consider your position carefully, and express it effectively. So on that note, let us comment on one more situation where this applies. You DO NOT need the last two pieces of chocolate cream triple layer pie at 2am. Wrong decision. Great morning, great day. Great you, good for others. Husband, Daddy, Author... and I was sleeping at 2. Sometimes the obvious eludes me. I have an idea and then get so caught up in so many thoughts and I want to chase each one and then they span out like a spider web on the walls of thought and before you know it they cross and twist and each line has a ton of branches coming off and all of a sudden I have created a forest of Wants and Do and Dreams and Goals and I'm Gonna and Soon I Will and .... before I know it I have created a wonderful portrait of the Amazon Rain Forest and I cannot follow a single idea to a clear picture let alone a plan to get it there. What have I created? So I look at the ball of yarn and my heart feels heavy for I feel all this desire to attack my purpose but my purpose seems to be so overwhelming. And in this exhausted-'I don't know where to begin' moment, I see that I forgot to hold onto the one loose end of the whole thing - the passion that began my mind racing in the first place. And often, it is here that we grab a piece of mixed up yarn, and we try to follow it in any direction just to find that beginning end piece. Try your best to maintain a grip on the desire, the reason, the passionate identifier that ignited your fire. Hold it in your thoughts, as your starter and the goal. I realize I am referring to having Lost my purpose in the clutter, but it works the same if you are just trying to identify it in the first place like the Bishop was referring to. We get distracted by all that is around us; especially despair. Despair can often drain us of our emotional sight, our picture making ability that shows us the movie role we see ourselves playing in this wonderful life. Despair can live in stress about money, work, family, goals, and.... hard to find my purpose. Figure out your passion. Figure out what causes the heartbeat to bounce. Entertain the idea...the thought... what would you do if you could do THAT for a living? If you could do that to earn money, or to be happy, and to make a difference. Follow a different line of thought and consider it all possible. Figure out your passion... and what you want to do with it... your Purpose will introduce itself to you. Husband, Daddy, Author....and Purpose Explorer. Do not limit the idea to politics, just because a President is saying it. Do not limit and dispense the idea, because you are not into that "motivational stuff". Do not pass over the idea as just another wide meaning general comment. Take an uninterupted moment, and think about one thing you are wanting to be different. One thing, one thought, one picture in your mind, one feeling in your heart, one lost and frustrated minute.... one thing that stalls your progress and has you bound to it. We are the change we seek. We have the power, the energy and ... and ... the knowledge to overcome the obstacle. We just need to put the moment into our hand ... sneak away to a quiet place ... open it up ... and set our thoughts on a new approach. We are capable, if we believe. Great morning, Great day. A great you, means a good day for others. Husband because she believes in me, More Daddy than I expected I could be, Author because I changed me, and Stepping forward into the Yet to Be. Sunday is a great day for some Self Care. We need to take care of ourselves so that we are charged up for the week to come, but also just for any day to day encounters we have. Do something for awhile today that is all about you. Something that makes you glad for you. Do something that you like to do, and not something that satisfies a schedule for some other purpose. Self Care... a vital ingredient in our success. Great morning, great day. Great start for you, great day for others. Husband, Daddy, Author... and Cleaning up some To Do items cause it feels good.